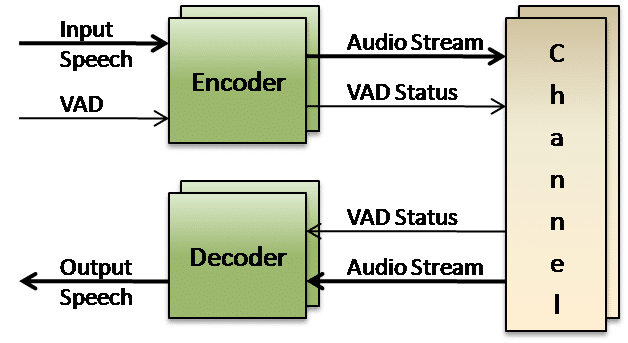 VOCAL’s wideband speech coders, using proprietary methods, have extensive code optimization to support modern processors (DSP, RISC and CISC). VOCAL’s highly optimized C with limited assembly code compares well in benchmarks against other vendors implementations. While the difference in performance is within a couple of MIPS, the portability and maintainability of our code benefits our customers by lowering the initial costs, easing integration, reducing maintenance costs (fewer coder changes when upgrading compilers), and providing greater availability of optimized code for a variety of processors. Contact us to discuss your application requirements. Wideband speech coders use more of the voice signal bandwidth than available in traditional telephone systems. Plain old telephony service (POTS) was constrained to a bandwidth range of 200 to 3400 Hz with engineering decisions/limitations dating all the way back to Alexander Graham Bell in the 1870’s. In contrast, the natural human listening range covers 20 Hz to 20,000 Hz (20 KHz) with human speech utilizing signal energy up to 14 to 15 kHz. The bandwidth limitation of our telephone systems have resulted in billions of requests over the years hence to repeat statements because of poor intelligibility. High definition audio (HD audio) includes the use of wideband signal processing (for echo cancellation/ noise reduction) and the use of internet wideband voice codecs suitable for VoIP applications. The wideband voice compression algorithms used for HD audio generally have a bandwidth of 50 Hz to 7 kHz thereby capturing a fuller conversation experience resulting in greater intelligibility. HD voice is an obvious improvement to well established legacy vocoders and its widespread use will drive VoIP deployments first in intra-business communications, then inter-business communications, and ultimately to universal communications. Grandma may finally hear the high-pitched squeals of joy from her grandchildren before they come to visit. With the greater availability of network bandwidth, such as found in high-speed cable modem networks and fiber deployments like Verizon FiOS and AT&T U-verse (SM), less and less speech coding needs to be performed. Simplicity, minimization of delay and resilience against packet loss is perhaps far more important than conservation in bandwidth when the more advanced wideband speech coders bring the encoded speech rate down from 64k bps to approximately 16k bps.